Sources indicate that as early as tomorrow, the President is expected to submit a request to Congress to take back from states roughly $15 billion in "unused appropriations leftover from prior fiscal years"; this is the first of what administration officials say will be several rescission proposals in the coming months. This initial proposal, which uses a provision of the Congressional Budget and Impoundment Control Act of 1974 (find more information on this law here), is expected to leave the $1.3 trillion fiscal 2018 omnibus spending law (PL 111-141) untouched - for now - although the exact contents remained under discussion. As of last week, the White House was considering a $60 billion package, that would include some proposed cuts to the omnibus on top of rescinding unobligated balances. Action Item: Continue to educate your Members about the value of programs you care about. As reported in previous In Brief, the House Committee on Agriculture approved H.R. 2, the Agriculture and Nutrition Act of 2018 (also known as the "Farm Bill"). Introduced by Rep. Conaway (R-TX), the bill includes sweeping changes to nutrition benefit programs and reduce or cut SNAP for millions of people across the U.S., including many people with disabilities and low-income families. Sources indicate that the bill will go for a vote on the House floor the week of May 7. Action Item: Use this pre-crafted letter (that can be personalized) to continue to educate your Members about the importance of food security for people with disabilities and low-income Americans. Action Item if you are in DC: Join the SNAP rally on May 8th in front of the U.S. Capitol. More information on time and location can be found here. Also within this bill is funding for "agriculture association health plans"; this provision would provide $65 million over four years for associations of ranchers, farmers or other agribusiness owners to obtain grants or loans from the government to offer their members health coverage. Those who are opposed to association plans argue that because these plans are not subject to the current healthcare law, varying requirements can be set depending on the state in which they operate, which could lead to barriers to enrollment, increased out of pocket expenses, lack of comprehensive coverage, and more. However, Dan Mendelson (chief executive of Avalere Health) explains that "rural communities have long lacked enough health insurance options. Although it's too early to say how well agriculture association plans might work, they could present a viable option under the right circumstances". On May 9, the House Small Business Committee is holding a hearing entitled Ready, Willing, and Able to Work: How Small Businesses Empower People with Developmental Disabilities (DD). The purpose of the hearing is to "examine the role small businesses have played in employing individuals with differing abilities and the lessons that have been learned". Action Item: If your Representative is a member of this committee, we encourage you to follow-up by giving examples of ways you and/or your Center is engaged around community employment for people with DD in your state or territory. As reported in last week's In Brief, advocates should continue to work with their state Medicaid Agency and Members of Congress regarding: 1) comprehensive person-centered planning best practices, 2) timely notice of public comment periods in order to respond to revised statewide transition plans, and 3) ongoing monitoring of settings that were deemed isolating. On April 27, Representative Grothman (R-WI), as a follow up to a letter sent to CMS, introduced a bill to redefine congregate segregated work as integrated employment - Workplace Choice and Flexibility for Individuals with Disabilities Act (HR 5658). 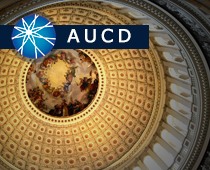 AUCD is monitoring this bill and educating around the impact that this bill could have on meaningful employment opportunities for people with disabilities. Action Item: reach out to your Members of Congress and education them about the importance of, value of, and capacity for community-based competitive and integrative employment for people with disabilities. For information on the Rule and what is happening in your state, please visit https://hcbsadvocacy.org. If you have any questions please contact Christine Grosso. On April 30, the Department of Health Care Policy and Financing in Colorado announced that Governor John Hickenlooper signed House Bill 18-1326, which will help eligible Health First Colorado (Colorado's Medicaid program) members living in institutionalized settings move into community-based settings with local services and supports. As of December 2017, 328 Health First members transitioned into the community at a savings of more than $2.8 million to the state of Colorado. Ninety-three percent of members who transitioned are still successfully living in the community. Action Item: If you are from Colorado please thank Governor Hickenlooper. If you are not, please continue to educate your Members on Congress on the importance of MFP in your state. Last month, The Leadership Conference on Civil and Human Rights circulated a sign-on letter urging Congress to hold oversight hearings on Commerce Secretary Wilbur Ross' decision to include a citizenship question on the 2020 Census. AUCD and more than 300 organizations signed on from across the country. Since then, two more lawsuits have been filed in addition to the lawsuit filed by the state of California and the multi-state lawsuit spearheaded by New York Attorney General Eric Schneiderman with co-plaintiffs The U.S. Conference of Mayors. On April 11, a group of individuals from Maryland and Arizona filed a lawsuit in federal court in MD to challenge the Trump administration's addition of a citizenship question on the 2020 Census questionnaire. The litigation is being supported by the National Redistricting Foundation (NRF), a 501(c)(3) affiliate of the National Democratic Redistricting Committee (NDRC). On April 17, the Lawyers' Committee for Civil Rights Under Law, filed a lawsuit on behalf of the City of San Jose and the Black Alliance for Just Immigration, a California-based immigrant rights group. All of these lawsuits allege claims based on constitutional and Administrative Procedure Act grounds.